If your tarot number adds up to 3, your personality and soul is represented by the Empress. Deeply compassionate and nurturing, you’re a natural mother. If you’re not birthing children, you’re busy birthing new creations in the form of art, food or music, anything that inspires the senses. You are sensuality embodied and when you focus on your task, unusually prolific. Your kind nature draws many wayward souls your way and you do your best to help them all. To the Empress, nothing is more important than creation and creation grows from love. 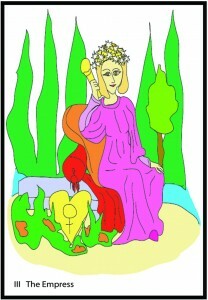 The Empress is the soul symbol for both the Hanged Man and Universe personalities. § 2 Responses to Soul Card #3 – The Empress"